My last week or so has been a mess of snow, ice, rain, slush, and almost every form water can take on this planet. To say this has make footwear an issue is an understatement – stepping outside, one encounters slippery ice patches and ankle-deep puddles on the same block. So, I thought I would take a moment this week to talk about rough-weather footwear and the best options for keeping your dogs warm and dry. The most obvious, and obtrusive, option is a vulcanized rubber boot, such as the classic Hunter Wellington. Not the most stylish if you’re within 50 miles of a metropolis, these really get the job done. Charles Goodyear invented vulcanized rubber in the first half of the nineteenth century, some speculate by accident, and within a few years it gave us the full rubber boot and Charles Macintosh’s eponymous raincoat. Mr. Goodyear’s son, yet another Charles in our story, invented the Goodyear welt, which for our purposes is the necessary forerunner to the Goodyear Storm Welt. The regular welt, as I’m sure many of you already know, is a strip of leather between a shoe’s upper and sole, which allows the sole to be replaced indefinitely. Think of it like an anchor. The storm welt on the other hand, is a second band of leather stitched between the welt and outsole, but folded and stitched in the opposite direction from the first welt. Essentially this creates a sealed space between upper and outsole, instead of a crevasse. To my eye this looks best on country boots, in a beautifully-grained mahogany leather of an almost impossible thickness. If you need a storm welt, you should be wearing boots, not shoes. And for me, black shoes are all about looking sleek and polished, so forget it. Now there is a middle ground between these two options, which is my personal favorite – the Dainite sole. Forget commando or other rubber outsoles. This is the rubber sole to end all others. 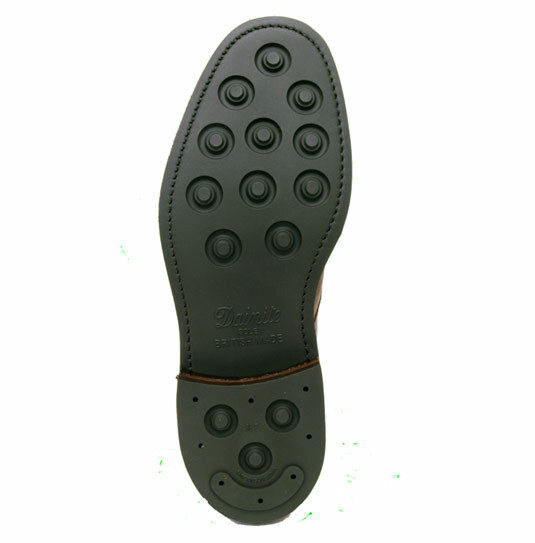 Thick, dense rubber, with a patented studded surface, the Dainite sole is made in England and has been since 1894. As long as your feet are solidly on the ground, they look almost as clean and formal as a leather sole, but without the rain-absorbing effect of the later once you step outside. I had a pair of boots with them that finally died, but while my current everyday winter boots have commandos, you can bet when I get them resoled I’ll be going Dainite or bust. Dry feet are a must. Dainite is a very good sole for wet urban conditions. Commando sole, then, has its place in off-road areas, where a sufficient grip is needed. However, neither of these does fare well in true winter (snow, ice, slush) setting. Commando sole has a too small of a texture to release the snow, rendering itself useless after a few steps when the small creases fill with snow and become icecaked. Dainite sole, then, while great when walking on pavement or asphalt, becomes slippery on snow and ice. Victory sole has a hand over Dainite and Commando sole in winter conditions. It has a large, wide spaced texture, which both grips and releases the snow when needed. It also has smaller, shallow ridges to make it useful in varying range of weather. All in all, in my opinion, it’s the best possible sole from late autumn to early spring, especially if there’s a need to stay outdoors. Dainite and crepe soles are my preference for long city walks during spring, summer and autumn. They just outlast any leather sole there is. And I must immediately apologize and make a correction to my text above: I mixed Victory sole and Ridgeway sole. I prefer the Ridgeway sole and my description applies to it. 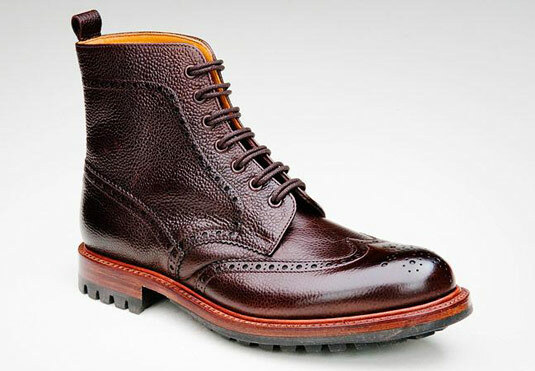 What is the wingtip boot pictured at the top of the article? The boot is the Lodger Tavistock.